You need to have Client Admin access to your site. Expenses is already turned on in Admin > System Functionality > Set Functionality Required. It is here that you can remove it before the expiry date of your free trial if you wish. 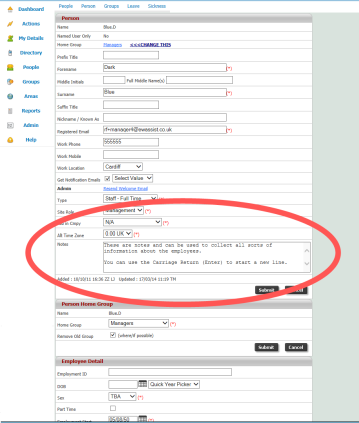 You MUST add 'Expense Admin' Functionality role to atleast one of your employees for that person to be able to see the full Expense menu. To do this a Client Admin should go to People > Employee name > Person (dropdown) > Functionality Role and add 'Expense Admin'. The Expense menu for all users is found by going to Actions > Expenses. From here monthly claims can be added and Open ones can be accessed. Claims are Open until they are scheduled for payment by Accounts at which point they automatically move to the employees Paid area. Open claims can be added to by the employee until they are digitally signed off by the employee after which only receipts and invoices can be added to support the claim (i.e. no new expenditure can be added). However subsequent claims for the same month can be raised for anything that is forgotten or for a contentious item that might be returned with queries. The Approval page is visible to all employees but, unless the user is a Group Manager or an Expense Claim Approver, no claims will be shown. Process is the menu normally reserved for Accounts to check and clear claims for payment, gather claims into batch payments (i.e. for October 2014) and other Account and Payroll tasks. Finally the Admin menu provides key settings to control the expense process such as financial periods, allowed currencies, exchange rates, mileage rates and custom pick lists. Having dispersed information across the business is unhelpful. Each employee has a different way of recording information and interpreting it. Employee come and go and the replacement has to find and understand the previous employees records. Three good reasons why it is better to centralise your efforts. Our software allows everyone to record their information in one place with the same rules and management processes as each other. It is better to have one available pot of information than a selection of spreadsheets, wall planners, notebooks and memories.